In the first part of this book, the reader is introduced to the theory of abelian groups focusing on the classification problem. The structure of totally projective p-groups is determined and Hill's version of Ulm's Theorem is proved. It is shown how this classification theorem is generalized to larger classes of abelian groups such as the balanced projective groups and Warfield groups. A variety of characterizations of these groups is proved generalizing corresponding results for totally projective p-groups. 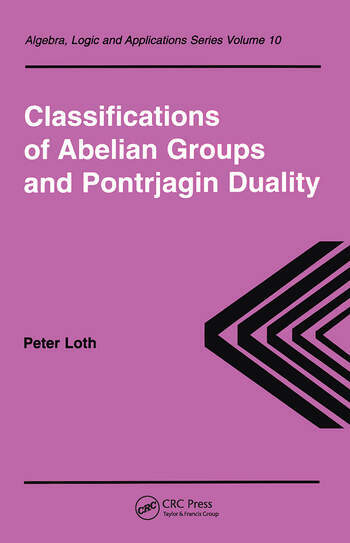 In the second part of this text, the author studies certain classes of compact abelian groups using Pontrjagin duality. After providing the necessary tools for dualization, the structure of the compact groups dual to the totally projective p-groups, balanced projective groups, and Warfield groups is established. Finally, the duals of completely decomposable groups and Butler groups are studied. Supplemented with numerous exercises and research problems, this book is suitable for graduate students, as well as undergraduate students with a sufficient background in algebra and topology. 1. Totally Projective Groups 2. Balanced Projective Groups 3. Warfield Groups 4. The Duals of Warfield Groups 5.